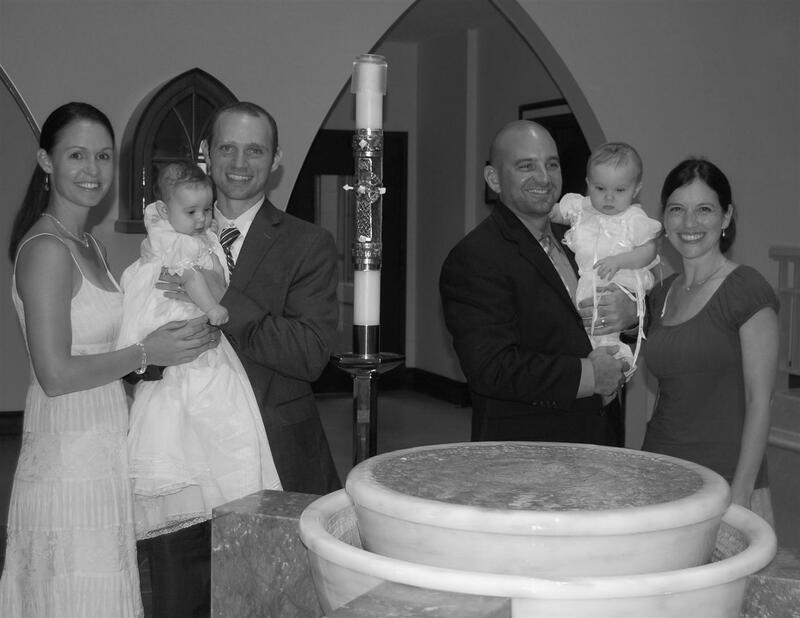 Madelyn Claire, her cousin, Carson Danielle and another new member of our church, Shannon June, were baptized on Sunday. The girls looked like angels, dressed in white from head to toe, pure and perfect, just like their little hearts. As I looked out upon the faces that were witnessing the sacrament I was profoundly grateful for our family and friends, the community that loves our girls and will guide them as they grow. And for Carson herself, I am so thankful she and Madelyn will have each other as they walk through life. I pray their bond only grows stronger as time goes on. Madelyn's Great-Great-Great Grandmother, Artimese Michaud, sewed a gown long ago that many people in my family have worn at their baptisms (including my mother, Aunts, and sister, Abbie). This gown was far too old and fragile to be worn by Madelyn but I really wanted her to wear something from that side of the family since that is where her namesake came from. What to do? Well, if you're my mom, you just simply replicate the French hand heirloom sewing techniques (which uses entredeux, a narrow strip of batiste with small holes to join lace to lace or lace to fabric) to whip up a new baptismal gown. The dress is absolutely exquisite and once again my mom amazes me with her talent for crafting all things beautiful. But then again, this is the woman who sewed her own wedding dress (two of my sisters and I were baptized in a gown made from the left-over fabric), bridesmaids' dresses and flower girls' dresses. She is also the same woman who would sew for hours and hours after the four of us kids went to bed at night. Many times I would wake up to a new Easter dress or birthday dress, all perfectly smocked and sewn down to the last detail. Thank you, Meme, for all those late nights and for putting so much love into every detail. Grandma Bernice will be so proud when she sees pictures of it! Carson wore the Flowers' family baptismal gown. At one point we took a picture of ten family members, including Toby and Patrick, who had worn the gown at their baptism. What a special family tradition! Congratulations to Madelyn and Carson on their baptism and thank you to everyone who made this occasion so memorable. A very special thanks to Madelyn's two amazing Godparents, Brandon and Mollie. We love you all! Not a day goes by that we don't thank God for our huge extended family and wonderful friends. We are truly blessed! Congratulations on Madelyn's baptism! What a beautiful dress made with love! Angie you are so sweet-and always such a grateful heart-Thank you. Such beautiful beautiful little girls-----a whole new generation of "The Little Girls". Viewing these pictures is just a reminder of how blessed we are...for our faith, our family and especially on this special day--for the Flowers & Bean Families. Gathering together for these occaions with Pat & Ray and Paula & Tommy is quite special-sharing this with these Grandparents who love these little ones just like we do! WOW! Can babies be any more BEAUTIFUL! I am so thankful to be Maddy's Godmother, and to be there on her special day. Congrats to Maddy and Carson! Little girls can make you have a permanent smile on your face for so long. I don't know what I am going to do without seeing Maddy when I go back to college. Love you all so much! Beautiful pictures, beautiful occassion and beautiful families!